While reading various medical publications – and even while attending some healthcare conferences – you’d be forgiven for thinking that the terms “patient engagement” and “patient experience” are interchangeable, essentially amounting to the same thing. The reality, however, is that the two terms, though intrinsically related, describe two separate and distinct interactions. Patient engagement refers to those individual and isolated points of patient/caregiver interaction – everything from physician appointments to patient portals, social media, tracking vitals with wearable technology, online educational sessions, and the patient actively participating in their own health and wellness. Points of patient engagement occur at every stage of the patient journey – before the patient enters a healthcare setting, during treatment, aftercare, and even long after recovery and healing. Patient experience, on the other hand, is the sum of all the engagements a patient has with his or her healthcare provider. Today, practically all players in the industry are talking about and focusing on improving the patient experience. However, in order to make a patient’s experience better, what needs to be considered is how well all the various patient engagements are working together in unison – and technology is playing an increasingly important role on this front. Medical providers have long understood the importance and indeed the value of ensuring patients are engaged with their own health. In this sense, the concept of “patient engagement” is in fact nothing new. What is new, however, is the role that technology is having. At Intermountain Healthcare – a not-for-profit healthcare system based in Salt Lake City with 22 hospitals and over 200 clinics, and the largest healthcare provider in the Intermountain West – patient engagement is a top priority. Its mission is to help people live the healthiest lives possible – and that means giving them ease of access to all their healthcare needs. Over the years, Intermountain has developed a panoply of function-specific apps in its pursuit of promoting patient engagement. But the problem was that the sheer diversity of its offering was complicating app discovery for patients – and that was having a negative effect on engagement. As Marc Probst, CIO at Intermountain Healthcare, explains: "The challenge we were trying to tackle was just the plethora of apps that are out there. Even within our own organization, we had facilities developing their own apps. It was just becoming a not-very-easy way to interact with the organization called Intermountain Healthcare." In 2015, Intermountain launched its solution – Health Hub. Like a Swiss Army knife of patient care functionality, Health Hub is essentially a collection of apps in a single, unified wrapper, making it much easier for patients to engage comprehensively with their healthcare. Users can access Intermountain’s My Health portal via the app, using it to message doctors securely, view test results, and manage benefits and claims. Clinicians can use it to send secure messages directly to Intermountain patients. And it also provides a platform upon which patients can order prescription refills, make bill payments, as well as accessing first aid tips and symptom advice. Then there’s GermWatch – a section that provides local epidemiological data, enabling users to view lists of currently prevalent diseases, common symptoms, charts of reported infections in recent months, and various maps that display distribution. It also includes tools for finding nearby healthcare facilities, locating pharmacies and doctors, and provides information on projected wait times. The drive for Health Hub, says Craig Kartchner, Senior Director of Marketing at Intermountain, is “to engage people in their own care.” And it’s doing so in the way that the modern patient wants that engagement to happen – through mobile devices. "When it comes to engaging people on digital channels, we're thinking more and more mobile first," says Kartchner. And new functionality is being added to Health Hub all the time. In June this year, Intermountain introduced a section that details hundreds of healthy hikes – including wheelchair accessible ones – to the app, as part of the organization’s continued to drive to promote patient engagement with their own health and wellness. "Utah's a beautiful place, we've got so many trails that so many people don't know where they're at, how to get to them, who can go to them, if their dog can go to them, if they're wheelchair accessible," said Intermountain Marketing Manager Collin Searle. "We wanted to make sure everyone had an opportunity to go and experience the outdoors and experience a healthy lifestyle." But the apps keep coming. Last year, Intermountain Healthcare launched Connect Care – a telehealth app that connects patients with healthcare providers via video and audio conferencing. The Connect Care service is open 24/7, and providers can diagnose and treat a variety of conditions, such as coughs, colds, sinus pain, ear pain, allergies, painful urination, minor rashes or skin conditions, flu-like illnesses, minor musculoskeletal complaints, and gastrointestinal issues. “This means that for many minor medical problems, patients can receive treatment from an Intermountain provider from their home or office without the need to come to an urgent care or doctor’s office,” said Dr. William Daines, Intermountain Connect Care’s Medical Director. 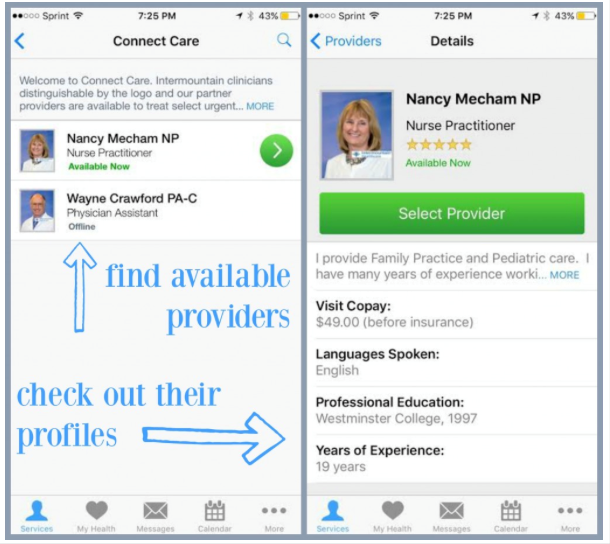 Connect Care seamlessly integrates with each patient’s Intermountain electronic medical record, meaning that providers are able to instantly access the patient’s medical history, and all clinicians that deal with any future in-person visits will have all the details of the online visit available to them. Beyond apps, Intermountain Healthcare’s commitment to patient engagement extends to social media channels as well. Intermountain knows that, in today’s world, in order to keep patient’s engaged with their own healthcare, then it needs to provide the right information to the right people at the right time on the right platforms – and social media provides the perfect means to achieve this. Kartchner believes “engaging the customer” is the future of healthcare, and the whole of Intermountain’s digital strategy is geared towards providing timely, actionable, and meaningful content to people via the channels that are most convenient for them. One of the best examples of this approach is found with Intermountain Moms – a campaign that stretches from a blog to Facebook to Twitter to YouTube – and aims to provide women in their childbearing years with ready access to lively and educational content that will help them become better engaged with their and their children’s health. In essence, Intermountain Moms is a community where people can get answers to their most pressing questions via live chats on social media from the comfort of their own homes. Intermountain Healthcare’s commitment to patient engagement across multiple touchpoints is indeed self-evident in its embracement of the various technology channels available to providers today. From its strategic approach to social media, combined with the multi-functionality of Health Hub, and the telehealth convenience provided by Connect Care, the result of focusing on particular points of patient engagement is an integrated and heightened patient experience for everyone who chooses Intermountain. Hear Shannon Phillips, Chief Safety and Experience Officer at Intermountain Health, at Next Generation Patient Experience 2017 this November. Download the NGPX 2017 Agenda to learn more.